Hooray for Ghost, Jason Reynolds’ novel that had me glued to the couch from start to finish. It’s a novel that grabs your heart and keeps you cheering for the main character, even when he keeps making mistakes. Ghost learned to run the day his father tried to shoot him and his mother. He didn’t think much of his talent until he came across the Defenders, an all-city track team. 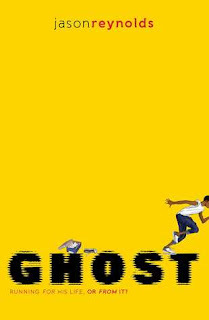 After being recruited to the team by the tough Coach Brody, Ghost decides he wants to channel all of his energy and rage into something good: being the greatest sprinter of all time. Of course, that’s harder than it sounds. There is so much goodness in this book: the camaraderie between the runners, the struggles Ghost faces, the way people love him and look out for him in their own way. I hope that every school library gets a copy and that teachers talk it up wildly. I still help make the summer reading lists for a school where I used to work, and this will definitely be on the list for the 8th grade. It’s that excellent.